The game of the Premier League season so far, Sunday's rivalry matchup will go a long way in deciding who finishes where come the end of the campaign. The two biggest rivals in English soccer are set to clash once again as Manchester United host Liverpool on Sunday at Old Trafford. Touted as the game of the season so far, there is plenty on the line for both teams. The Reds are looking to return to the top of the Premier League, while the Red Devils aim to further the lead between themselves and the rest of the field in the race for the final Champions League qualification spot. The fixture is set to deliver drama and excitement, and will be key in determining what the final league table looks like come the end of the season. The Red Devils rebounded well from their disappointing Champions League loss to Paris Saint-Germain, beating Chelsea at Stamford Bridge to advance to the quarterfinals of the FA Cup. It was a stellar performance, of course, but the home side were dreadful on the day, as the Chelsea faithful starting shouting expletives at their manager Maurizio Sarri and his tactics. United did capitalize on the situation, and put the game to bed before the end of the opening half. Now, all eyes are on boss Ole Gunnar Solskjaer to see how he handles the biggest game of his tenure so far. His tactics lead Man U to victory over Tottenham Hotspur and Arsenal, but he was out coached by PSG boss Thomas Tuchel. He still has to prove himself to some, but leading United to victory against Liverpool will go a long way as cementing himself as the favorite for the full time management job at Old Trafford. The wheels haven’t completely come off for Liverpool, but they are not the same team from earlier in the season. The Reds were running through opposing sides on a consistent basis back then, but the momentum has slowed down considerably in recent weeks. They know find themselves behind Manchester City on goal differential in the title race, although they do have a game in hand. Unlike United, they had their European responsibilities this week, as Liverpool drew 0-0 against Bayern Munich at Anfield. It was a solid performance, but was also one that reinforced two common themes of this Reds team in recent weeks. They are much improved defensively, keeping the Germain champions at bay even without star centerback Virgil Van Dijk. However, their attack has continued to stutter, as Sadio Mane, Roberto Firmino, and Mohamed Salah have failed to reach the blistering heights of last season. They can still turn up on any given day, and the United gameplan will have to revolve around stopping the dynamic trio. The last time these two sides faced off would be the last time former manager Jose Mourinho was in charge of Manchester United. It was an interesting game to say the very least. Liverpool controlled the contest early, and took the lead through Sadio Mane after a lovely bit of play. United would grab a surprise equalizer after a blunder from Alisson Becker, who spilled a loose ball into the path of Jesse Lingard, who dinked it into the back of the net. 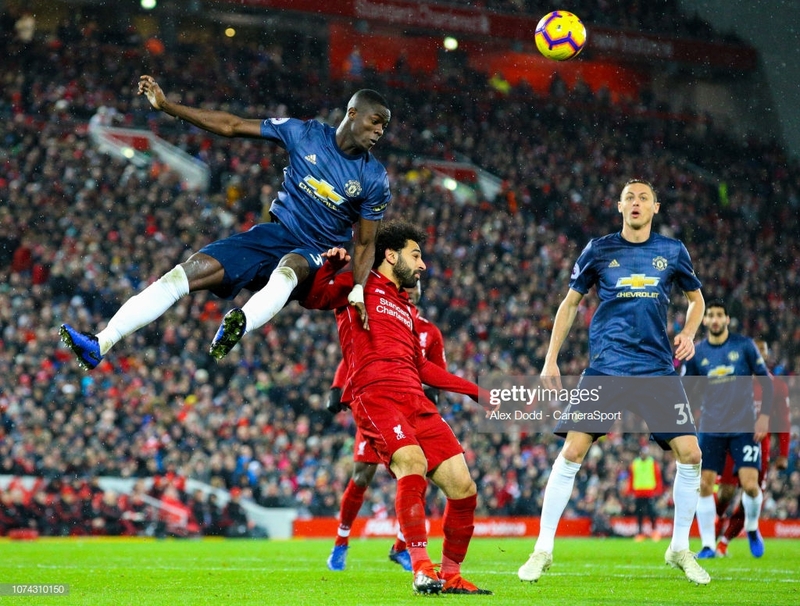 The Red Devils were set up like a typical Mourinho side, and were starting to truly frustrate Liverpool, who were forcing themselves to take ambitious long shots. However, the course of the game was changed when Klopp subbed on Xherdan Shaqiri to bring a new dynamic to the match. The Swiss international went on to score twice, although United fans would have been frustrated with the fact that both goals came as a result of deflections. It wouldn’t be enough to justify the performance to the Man United board, who fired Mourinho soon after the game was over. Solskjaer received a massive boost when it came to injuries, as reports surfaced that both Anthony Martial and Jesse Lingard will have a chance to return to the side against Liverpool. Initially ruled out for three weeks each, they’ve somehow managed to recover ahead of schedule and have themselves fit for this crucial fixture. United will only be without a pair of fullbacks, as Antonio Valencia and Matteo Darmian are still unavailable for selection. Liverpool will be without Croatian centerback Dejan Lovren, who has failed to recover from a lingering hamstring in time for the contest. The Reds are still dealing with two long term injuries to English talent, as Alex Oxlade-Chamberlain has only just returned to training, while Joe Gomez is still dealing with a fractured leg. Sanchez or Mata for United? Due to the good form of some players, and the injuries suffered by others, Solskjaer doesn’t have many choices to make when it comes to his starting lineup. Paul Pogba and Ander Herrera will be tasked with controlling the midfield, while Marcus Rashford and Romelu Lukaku will have to shoulder the goalscoring responsibilities. However, there is one spot that will be a coin toss between two players, as the third attacking spot on the field is still up for grabs. Juan Mata got the start against Chelsea on Monday, playing behind the front two in his preferred attacking midfielder spot. The diminutive Spaniard was crucial in linking up play for United, but his lack of pace hurt the team on the counter attack. Alexis Sanchez was subbed on with fifteen minutes to go, with Mata making way soon after. Sanchez did not do much going forward, but his help defensively was key in keeping the scoreline intact. His workrate impressed Ander Herrera, who made sure to let the Chilean know how happy he was at full time in a clip that went viral on social media. He hasn’t been able to prove it as much while at United, but Alexis is a big game player, and a contest the magnitude of Sundays match might be just what he needs to kick start his Red Devils Career. Who will make up the midfield three for Liverpool? Klopp is in a similar position to Solskjaer, as the team is mostly already picked. The front three and the fullbacks are almost etched in stone, with Van Dijk and Alisson guaranteed to start at the back. However, the midfield is wide open, with the manager having a number of options he can turn to. Georginio Wijnaldum is most likely to feature, as the Dutchman has become one of the most underrated players in the Premier League. The experience of Jordan Henderson means he’ll probably be relied upon as well, as he’s already played in countless derbies during his time at Liverpool. Shaqiri shined last time against United, while Adam Lallana usually saves his best for games against the Red Devils. Fabinho featured at center back against Munich, but could slot back into the midfielder with the return of Van Dijk. Naby Keita has gotten more and more involved in recent games, while James Milner is always someone Klopp can turn to whenever a job needs to be done. The German manager has a lot of room for flexibility in his midfield, and it will be immensely interesting to see who he decides to go with.